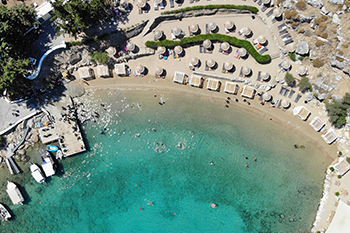 RHODES ISLAND, THE IDEAL DESTINATION FOR INCENTIVES, CONFERENCES, CONGRESSES, MEETINGS, BUSINESS TRAVEL, INTERNATIONAL CULTURAL AND SPORT EVENTS. 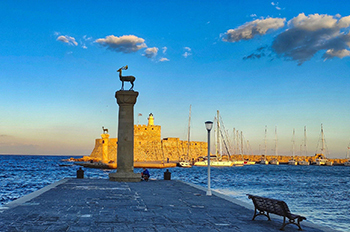 Due to its natural beauty and monuments, Rhodes has evolved to a tourist resort with international fame and therefore has built one of the best tourist infrastructures around the country, including some of the largest conference centres in the country. Luxurious hotels, restaurants of all categories, impressive shopping malls can easily satisfy even the most demanding visitor. The island is also famous for its vivid nightlife, where casino has the leading role, and the famous clubs and bars all around the island. The island of Rhodes can be accessed by sea and air. Scheduled flights from the airport of Athens and many charger flights during high season from several European airports make the island easily approachable to the tourists. Ferry services are also available from the port of Piraeus with ferries or high speed catamarans. The island also connects to other islands of Dodecanese and Cyclades and Crete. One of the most attractive destinations on the island is the Valley of the Butterflies, unique in the whole country. 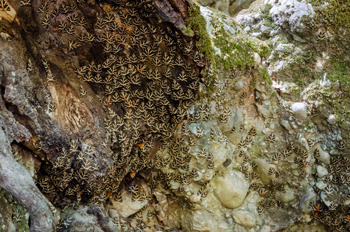 During August millions of colorful butterflies seek out areas of high humidity in order to reproduce and this valley next to the river Pelekanos is the ideal destination for them. The Aquarium of Rhodes as a part of the Hydrobiological Station is located in the northern part of the island and initiated its activities in 1937. Since 1963 operates as an Aquarium-museum and research unit with 28 tanks to house all manner of species such as turtles, dolphins and seals having as main goal to preserve species of the Mediterranean Sea. The Aquarium belongs to the National Centre for Marine Research which is developing its research activities in oceanography, fisheries and inland waters corresponding institutes. 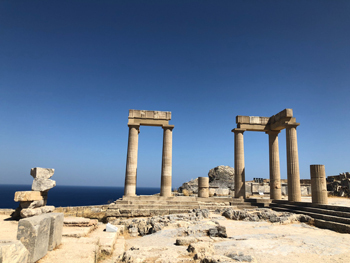 Rhodes has three Doric ancient cities with remains of occupation dating back to 3rd millennium BC and also settlements dating from the Mycenaean-Minoan period. Lindos is a traditionally built village on the foothills of an ancient Acropolis and a medieval Castle and is one of the most impressive archaeological sites on Rhodes. The dramatic natural landscape is enhanced by the picturesque quality of the more modern town. Although you will find the most important archaeological monuments at the acropolis, interesting ruins are also scattered at various points within the town and just outside it. 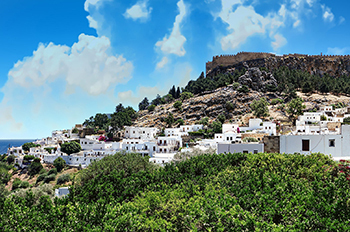 During the summer period Lindos is a busy resort with wonderful beaches and a well known destination for yacht owners. At Filerimos and the ancient city of Ialysos building remains are mainly on the Filerimos hill used as a strong point and also as a place of worship. During the period of Italian rule a 'Golgotha' was built: this was a series of shrines with relief scenes of the Passion, which leads from the square to the west edge of the plateau of the Filerimos hill from which you can enjoy the view. On the north-western shore of Rhodes, lies one more ancient city, Kamiros, where the ruins of an ancient Mycenaean necropolis close to the village of Kalovarda reveal as today. The scent of pine on every breath, rustic bridges and trickling streams set the mood for Seven Springs, found 30 km from the City of Rhodes. Those who want to rise to the challenge can wander around the maize of footpaths searching out the source of each of the seven springs. Lying across the entry road, there is a green lake with turquoise waters nestles in a pine clad gorge, also accessible by a sign posted footpath so as does a tunnel carrying a stream. Many non-claustrophobic visitors walk through the long dark tunnel of, who may also follow the signposted alternate route. Peacocks wander the site too and if they are not to be seen their penetrating cry is unlikely to pass unnoticed. 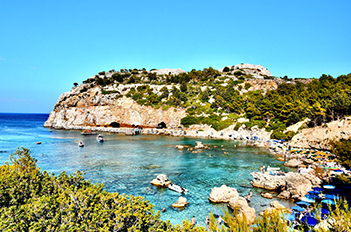 Kalithea, only 10 km away from the city of Rhodes, is a small bay to host a spa built during the 1920, recently renovated. Today only the domed pavilions and the archways stands, while the water have long-since dried up. The place has crystal clear sea waters and magical scenery of the time consumed buildings. Rhodes has a lovely coastline and beautiful plateaus on the mountains. Among the countless beautiful beaches of the island, Pefkos Beach is a stunning beach and a prime example of nature’s beauty. The color of the water shifts through every shade of blue throughout the day, simply begging for a refreshing dip. There are 35 miles of golden sand, and the beach is certified blue flag which is only awarded for high standards of excellence. 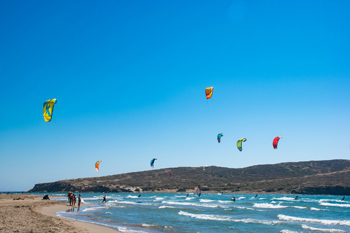 Other popular beaches of the island are: Faliraki, Afandou, Kallithea, Lindos, Tsambika, Gennadi and many more, here visitors can relax and enjoy sea sports. 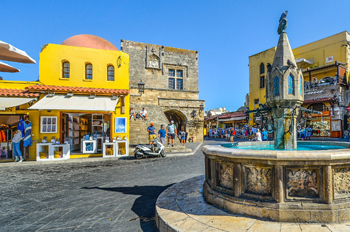 The Medieval City of Rhodes is oldest inhabited medieval town in Europe and has been declared a World Heritage Site. Containing ruins of the Temple of Venus and her offerings dating from the 3rd century B.C., offers an opportunity to loose track of time or direction since there are about 200 un-named streets or lanes explore. 500 years ago Christians used to live here in order to avoid the Muslim Ottoman Empire which controlled all of the surrounding area. Nowadays surprisingly 6000 inhabitants live in this mysterious world where the heart of the city beats, full of shops, cafes, restraints and museums making it a highly visited destination. The giant walls surrounding the city serve as a constant reminder to the intriguing history of this fascinating place. The delightful Palace of Grand Masters which was constructed in the 14th century by the Knights of the Rhodes, who occupied the area during that period, is located at the end of Street of Knights. Today’s structure is a restored version of the original Palace which suffered damages in 1856 because of an ammunition explosion. The two circular towers of the palace and the gate with its pointed arch, on either side of which they stand, is one of the few parts of the structure which survived. However the building remains a must see as it is enormously impressive, where visitors will have the chance to see many impressive rooms with fine pieces of furniture, polychrome marbles, statues carpets, Oriental vases. Among these rooms particular mention should be made of the waiting room, the reception hall, the room of the Medusa mosaic, the room of the icons, the ballroom, the music room and many more, 158 total but only 24 open to public. The Archaeological Museum of Rhodes was constructed by the crusaders as a hospital in the 15th century. This grand structure took 50 years to build and nowadays it contains 13 collections of different artifacts; some of them are over 2000 years old. The Acropolis of Rhodes is situated on a hill as it was constructed for defense purposes. Overtime more buildings would spring up stemming from the acropolis turning the original settlement into a town. This extraordinary site consist of the Temple of Athena Polias and Zeus Polieus on the northern edge of the Acropolis, Odeion, Temple of Pythian Apollo, Stoa building, Artemision, Stadium, Gymnasium and the Library. Faliraki Water Park is one of the most exciting ones being one of the largest in Europe. The selection of slides, lazy river rides, rafting, wave pool, aqua-gym and many other thrills and spills can be a thrill the entire family. The Ostrich Farm Rhodes makes a fantastic day out for the whole family where especially children will be amazed by the wild and exotic animals on display in this safe and friendly attraction that hosts not only over 120 ostriches, but also camels, goats and donkeys. The options of outdoor activities in the island due to its size and geological nature can vary. From jeep safari, horse riding and golfing though its modern and fully equipped facilities, to walking, hiking, trekking for nature lovers and scuba diving, Rhodes has something for everybody. 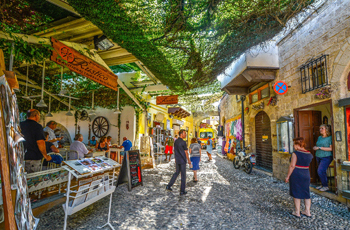 Rhodes also proves to be ideal destination for religious tourism. 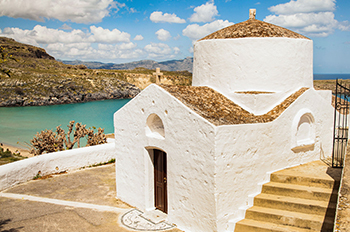 The Church of Panagi is a remarkable sight to behold with a white washed appearance on the outside and a domed shape with red tiles while the interior flooring is a beautiful black and white mosaic which is common feature of the Lindos area. Also the monastery of Profitis Ilias is situated in the centre of a pine-wooded forest named after the Prophet Elias offering beautiful landscapes with colourful wild flowers. The monastery of Tsampika is a tiny, Byzantine church, dedicated to Mother Mary, located on the top of a hill, offering breathtaking coastal views. The road takes the visitors half way up the hill to follow 350 steps to finally reach the monastery. Another reason that makes it worth, to climb up, is according to the legend, any woman having problems getting pregnant should go up there barefoot, to pray to the Virgin and she will be blessed with children. Given that Rhodes has always been a crossroad of cultures, the taste and the nutrition information derives from Asia, Europe and Africa. The basis of Rhodian diet was always the Mediterranean one, while most food items come from island’s farming and fishing. Due to its warm climate and the soil’s diversity and fertility, Rhodes cultivates olives and citrus fruits along with fresh fruits and vegetables such as avocado, arugula and tarragon, all particularly tasty and sweet. Today’s Rhodian culinary delights vary from seafood and fresh salads, to meat products, honey and lovely deserts such as belekounia, a sesame and honey sweet. The wines of Rhodes are world famous for their exquisite taste and high quality since ancient times, with numerous local vineyards and distilleries to produce dry white and red wines as well as sparkling one.